The Gold Dust Day Gecko, a native to Madagascar, sometimes referred to as the Madagascar Day Gecko, does well in a tropical climate. Unlike most geckos, it is a diurnal animal, active during the day. They are territorial animals; males are especially aggressive towards other males. These geckos are very colorful, usually bright green or a yellowish green. Halfway down their backs, they have three red teardrop markings. A blue shade is present around the eyes with bright gold markings on the back and neck. They feed on various insects and other invertebrates and are capable of eating other smaller lizards. They also eat soft, sweet fruit as well as pollen and nectar from flowers. But they don’t bite humans. Although these geckos will come into the house, probably looking for food, they are an arboreal species, spending most of their time in trees. If exclusion is desired, treat them as you would mice, rats and cockroaches; make sure to screen all windows, doors, ventilation passages and any small openings into the house. Another species of gecko is the House Gecko, residing with humans in homes rather than in the wilderness. Being aggressive, this pale brown gecko drives other species away from the house. They are primarily nocturnal. 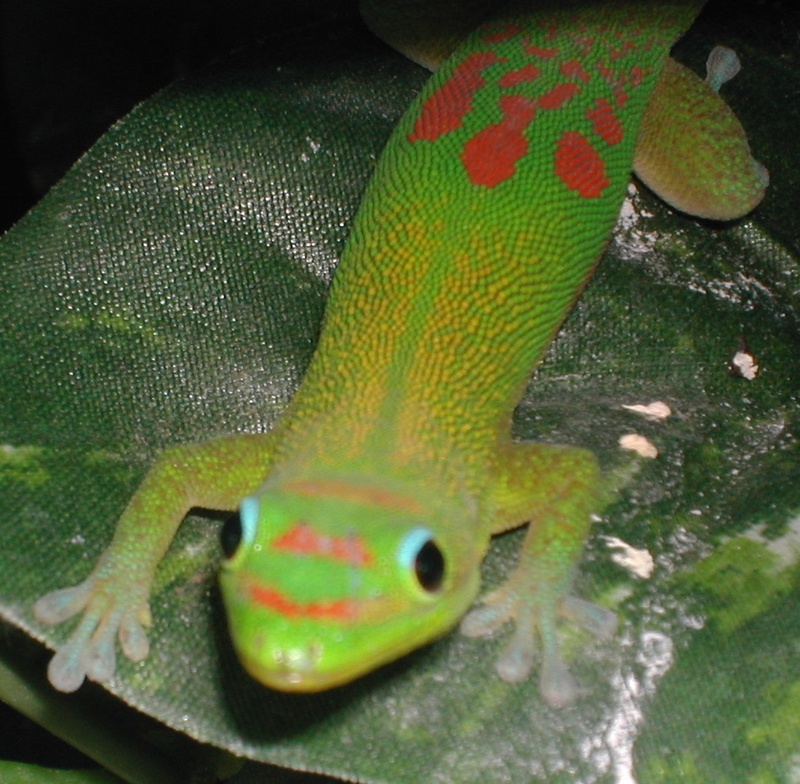 There are over 900 species of geckos worldwide, but only seven or eight reside in Hawai`i. Geckos are the only lizards who are able to make sounds, other than hissing. Feeding on cockroaches, mosquitoes, ants, termites and moths, geckos are beneficial to home owners. It has been thought that geckos are able to run up and down walls and ceilings due to tiny suction cups on their toe pads. However, recently scientists found that geckos have a network of tiny hairs and pads on their feet. With millions of hairs on each foot, the combined attraction of the weak electrical forces allow the gecko to stick to virtually any surface, even polished glass. Occasionally citrus trees have been pruned up off the ground. Some have asked, "What is the reason for this?" Skirt pruning of citrus has been around for a long time in those countries surrounding the Mediterranean Sea. The skirt of the tree includes those branches which hang down and touch the ground or are near to the ground. In Italy, the skirts are pruned as high as the goats can reach. 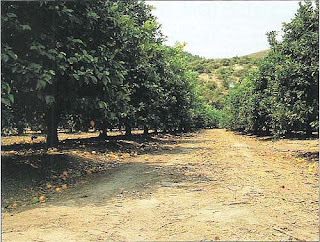 In the United States, California in particular, skirt pruning done with clippers or a pruning saw, not goats, is a recent development and mainly came about as a means of controlling snails in the orchard. By skirt pruning, usually 18 – 24 inches, snails as well as ants are denied easy access into the tree. Then the trunk is the only route. Farmers can concentrate their pest control efforts on a small area, the trunk, rather than spraying the whole tree with pesticides. In the case of snails, copper foil is often banded around the trunk; snails will not cross the copper band. For ants a sticky material is sometimes applied. 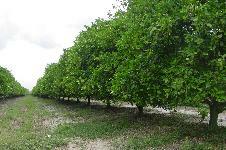 Skirt pruning will also help control brown rot disease of citrus fruit. Since low hanging fruit is eliminated, the overall fruit quality will improve. Many people are drawn to raised bed gardening for several reasons. In addition to the fact some areas do not have sufficient soil, raised bed gardens generally look nice and appear easy to maintain. In many parts of the United States, reasons for building raised beds are to keep gophers out or to have warmer soils in the early spring after the winter thaw. For portions of the Hawaiian Islands, gardening in raised beds or containers is necessary because of a lack of soil on lava hardened terrain. (4.) the gardener prefers less stooping. 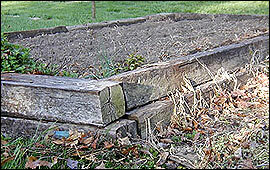 On the other hand something to consider is the maintenance of raised beds. If the frame is made of wood, it will eventually rot. If metal is used, it may rust. Actual construction of the bed can be time consuming and costly. In addition to wood, rock and plastic can also be used. Two questions often arise. First, how deep do I need to make the beds? The literature gives a range of 6” to 18”. Crops like lettuce, onion and bok choy will do fine in a shallow bed. Yet deeper beds are needed for carrots, parsnips, corn and tomatoes. Secondly, where do I get good soil? You can buy bagged potting mix at the garden store, which can be very expensive. Or you can buy a truck load of soil but be cautious. Soil may look good, but you can’t see N-P-K deficiencies or excesses, pathogenic fungi, bacteria, nematodes or pesticide residues including persistent herbicides. Bringing in soil can be risky. Installing raised beds can be a satisfying project. But first, find out what your particular problem really is and why you are considering a raised bed. Perhaps correcting the problem would be a better solution than a raised bed project. Possibly cheaper and less time consuming. Photos from University of Missouri. 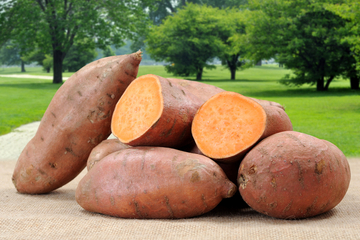 What is the difference between yams and sweet potatoes? Are they the same, yet by a different name? Many years ago orange colored sweet potatoes were introduced to the Southern United States. In an effort to distinguish these from the traditional white-fleshed potato, producers called them yams, which is the Anglicize African word, nyami. 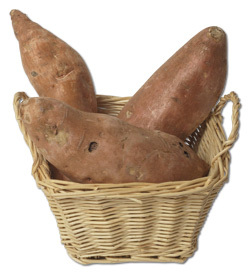 Today, most of the starchy tubers consumed in the US and labeled as yams are in reality sweet potatoes. Yet yams and sweet potatoes are not the same; in fact, they are quite different from each other. As far as botanical order is concerned, they are at opposite ends. The sweet potato is a dicot, set in the morning glory family. The sweet potato, whose sweet and moist flesh varies in color from white to yellow and orange, is native to South America; the skin is typically smooth. Garnet, Jewel, and Beauregard are orange fleshed sweet potatoes that often masquerade as yams in the local supermarkets. Yams, on the other hand, are a monocot, closely related to grasses. In contrast, yams are dry and starchy and rather bland. While yellow or purple in color, the skin is rough and a bit shaggy. Yams are native to North Africa and Asia. They range in size from that of a small potato up to 150 lbs. Yams are a primary agricultural crop in West Africa, where 95 percent of the world's yam crop is grown. Incidentally, both yams and sweet potatoes can be purple. In this article, we are not speaking about genetically modified organisms (GMO'S). A GMO is a plant, animal, microorganism or other organism whose genetic makeup has been modified using genetic engineering, i.e. gene modification, recombinant DNA methods (also called gene splicing) or transgenic technology. A hybrid is defined as a plant that results from the cross between two plants of differing genetic characteristics, i.e., two species, subspecies, cultivars, varieties, etc. Some crosses may occur naturally, but most hybridizing is deliberately done by man in order to produce a plant with improved characteristics such as disease resistance, greater vigor and uniformity. Hybrids generally have higher yields and better exterior quality. Today, hybrid seed is prevalent both in agriculture, as well as home gardening, and is a major contributor to the rise in agricultural output in the last 50 years. The commercial hybrid market actually began back in the 1920’s, when the first hybrid corn was produced. The disadvantage of using hybrid seeds is that the resulting seed cannot be used at the end of the season for next year’s crop. The seed taken from a hybrid will either be sterile or produce plants that are not true to the mother plant, i.e., not true to type. Thus it becomes necessary to purchase new hybrid seeds each year. On the other hand, heirloom seeds are from open-pollinated varieties. This means that plants grown from these seeds will be identical to their parent. In addition, their genes have not been subjected to modern breeding techniques and manipulation. Note: All heirloom varieties are open-pollinated but not all open-pollinated varieties are heirlooms. Heirloom seeds can be saved from year to year and planted for the next crop. Although they may have some built-in hardiness, heirlooms generally do not possess disease resistance, vigor and uniformity that hybrids do. One of the main advantages attributed to heirlooms is their excellent flavor. In hybridization programs, plant breeders sacrifice flavor in preference to other attributes such as disease resistance and higher yields. "May I borrow your house?" is the Mayan translations for Mah-Ha-Na. This is the name for the moth which often rests at night under the eaves of the house. The common name is Black Witch Moth, Ascalapha odorata. Its wingspan can reach 7 inches. The wings are dark brown, and both pairs are crossed by a series of alternating light and dark wavy lines. There is often an iridescent blue cast over the wings. Females have pinkish-white bands across the middle of both wings, whereas the males lack these pale bands. In addition to the Hawaiian Islands, they are common in the Caribbean, South and Central America and migrating into the continental USA and southern Canada in the summer. This moth lives in the tropical and subtropical forests where trees of the pea family grow. This includes acacias, albizia, cassia and samanea (monkeypod). The caterpillars feed on the foliage of these trees. The moth often flies great distances in only a few nights, hiding by day wherever it can find dense shade, frequently under the eaves of houses. While they mostly fly during the summer season, in the southern areas of the United States and in Hawaii, they are also known to fly during late October, hence the name Black Witch Moth.